There’s a big chunk of BlizzCon’s schedule every year now swallowed by the StarCraft II WCS Global Finals, and rightfully so. But the rest of it is up for grabs among the rest of Blizzard’s current roster: Diablo III’s upcoming Reaper of Souls expansion, World of Warcraft, the Warcraft movie, Hearthstone, and the newly re-announced All-Stars, Heroes of the Storm. Here’s what’s happening when, and what it might mean. 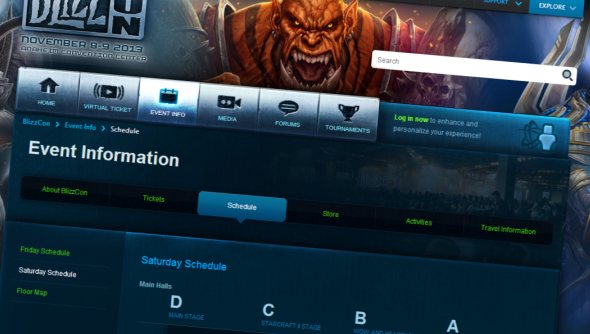 BlizzCon runs between Friday, November 8, 2013 and Saturday, November 9, 2013, beginning 9:30am and finishing 10:00pm PT on both days. The first new announcement will have happened by lunchtime on the Friday, when WoW’s design team will be notifying fans of “upcoming content, features and game updates” in a talk entitled ‘World of Warcraft: What’s Next’. What’s next? A new expansion, probably. WoW subscriptions are declining at a fairly scary rate, and a follow-up to 2012’s Mists of Pandaria would bring back old players, as well as plenty of healthy news coverage. Our Tim reckons it’ll be at least a year away, however. That’s to be followed up by ‘World of Warcraft: The Adventure Continues’ – a panel discussion of Azeroth’s story and lore headed by game director Tom Chilton, creative director Alex Alfrasiabi, lead narrative designer Dave Kosak and senior VP of story and franchise development Chris Metzen. With the Horde’s apparently benevolent new warchief now installed, expect to hear about the shape of Azeroth in the aftermath of Garrosh’s Orgrimmar takeover and eventual defeat. Elsewhere on that packed Friday afternoon, there’s a single StarCraft II panel – dedicated to Arcade, balance, and tournaments – plus an ‘overview’ of Heroes of the Storm which promises details of core mechanics, hero rosters, reward systems and “the variety of challenges you’ll face on the battlefield”. The splurge of new All-Stars information will continue the following day with live sessions performed by the MOBA’s designers, and a ‘Deep Dive’ development chat. There, Blizz will explain the process of creating their heroes and maps. Saturday’s most notable events also include a Warcraft movie presentation, in which director Duncan Jones will be joined by Metzen, chief creative officer Rob Pardo and god-knows-who-else – Colin Farrell? With any luck, they’ll have brought some CG test footage with them – shooting begins at full pace early next year. Dotted about both days you’ll find plenty of talks on Reaper of Souls – and it’s hard to imagine that Hearthstone won’t appear in the opening ceremony as well as the fireside chat scheduled for Friday. I’m going to go and get changed out of my specul-a-shoes. What are you hoping to see dominate Blizzard’s announcement calendar this year?